Fifteen persons comprising eight men and seven women have been on an indefinite hunger strike for eight days now at a place called Idinthakarai adjacent to Koodankulam in Tirunelvely district of the Southern state of Tamil Nadu in India. The indefinite hunger strike is a continuation of a long drawn out peoples struggle a nuclear power plant being set up and commissioned in Koodankulam. The India-Russia Nuclear plant project got underway in the eighties of the last century but a vigorous peoples protest going on for nearly eight months has prevented it from commencing operations. The protests have been spearheaded by a committed grass roots activist SP Udayakumar who is the Convenor of the Peoples Movement Against Nuclear Energy (PMANE). The sustained campaign against the nuclear plant being commission entered a new phase on March 12th 2012 when a relay of protest fasts were held at Koodankulam in opposition to the nuclear plant. On March 19th the authorities cracked down by deploying thousands of Police and para-military personnel to Koodankulam. Several leaders of the non – violent peoples struggle were arbitrarily arrested and charged for sedition The inhabitants of Koodankulam were forcibly evicted from their village. The Para – military and Police personnel also cordoned off the village and curtailed transport to and from the village. Inflow of food and medicine and other essentials were restricted.Outsiders were not allowed to come in. Media access was denied. The forcibly dispersed people relocated to neighbouring Idinthakarai village where the protest demonstration continued. The PMANE convenor SP Udayakumar commenced a fast unto death campaign protesting the crackdown and arrests. 14 others comprising seven men and seven women accompanied him on an indefinite hunger strike in solidarity. Thousands of people from Koodankulam,Idinjakarai and other villages in the region have assembled in sympathy and in support at Idinthakarai where the Koodankulam nuclear project protest ampaign continues. Despite threats and intimidation and offers amounting to bribes the fast continues. Despite news stories planted in sections of the media that the protest has fizzled out the indefinite hunger strike goes on. It will enter its ninth day on March 27th 2012. As stated earlier the on going hunger strike is the culmination of an eight month struggle launched by the peoples movement against the commissioning of a hazardous nuclear plant in their vicinity. While more than 200 protestors have been arrested in batches over the past weeks, Udayakumar and his core group of hunger strikers have not been arrested yet. One reason for that may be due to thousands of people including women and children keeping vigil over the fasting persons both day and night.It may be that the authorities fear a huge backlash if the highly respected ,popular Udayakumar and his fasting band are arrested. The Police have surrounded the area in large numbers and set up a blockade around Idinthakarai village where Udayakumar now resides. Food and medicine supply have been curtailed. Journalists have been denied access. Udayakumar obtained a Ph D at the University of Hawai in the USA and then returned to India where he set up a school for poor children. Along with his wife,Udayakumar founded the South Asian Community Center for Education, Research and Action-SACCER near Nager Koil in Kanniyakumari district in 2001. Last week this free enrollment school with 250 children was destroyed by those a gang of hooligans backed by sections of the Police. The Koodankulam nuclear project is an Indo-Russian joint venture.Currently Udayakumar is being vilified as an American Agent. The Christian church is also being blamed for the protest.. Ironically the supposedly US backed protest has also been labelled as Maoist and Naxalite. 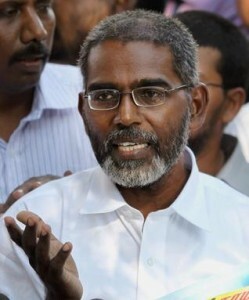 SP Udayakumar is an inspired , sincere activist who has embarked on a tremendous struggle against overwhelming odds.I have the greatest respect for his courage and dedication. Factual information about the Koodankulam-Idinthakarai situation is hard to get due to the controls imposed by the Indian state. Udayakumar was sending out e-mails frequently in the early days. Nowadays it has become infrequent as the fasting persons become progressively weaker. Some of his friends are circulating Udayakumar’s e-mails widely in a bid to attract global attention to the David vs Goliath battle going on in Koodankulam-Idinthakarai. I would like to reproduce two of them here. In references that convey depths of feeling and meaning Udayakumar cites in these e-mails the burning of the JAFFNA LIBRARY and MULLIVAAIKKAAL. “Police have arrested 18 men more at Koodankulam last night but nothing happened here at Idinthakarai. Some 5,000 women, men and children slept around St. Lourdes Church. Some 185 men and women and their Parish Priest were arrested at Koottapuli village when they sat down by the side of the road protesting against the police peacefully. They are being held at Tirunelveli armed reserve camp. The other group of nine people, including our Struggle Committee members, arrested yesterday and now charged with sedition, including Sections 121, 121A and 153A, have been taken to Tirunelveli also and we do not know where they are being held. “Police have clamped down Section 144 in our area prohibiting people from congregating in any manner. So no one can walk or move around. Despite this curfew, people keep coming to Idinthakarai by boats and on foot. There is an unprecedented deployment of police around Koodankulam and it is highly condemnable that the police be harassing the peaceful protesters to this extent. “There could be public health problems and food shortage in a few days here at Idinthakarai. “We appeal to the people of Tamil Nadu to be aware of this assault on the Tamil community. “We appeal to the people of India to be mindful of impending nuclear nightmares in a highly and densely populated country such as ours. “We appeal to the people of the world to keep a watchful eye on the forceful implementation of a mega nuclear project on our people without giving us any basic information about the project or conducting any public hearings. “They are preparing to load uranium fuel rods into the reactor without conducting any safety or evacuation drills. This kind of Fascist development is taking our country to another round of New East India Companies and Neo-colonialism. “The situation here in Idinthakarai is still grim. There are some 10,000 people from coastal and interior villages. Most of them are women including pregnant and nursing ones. I myself saw many nursing women feeding their babied sweetened water as there was no milk coming to the village. More people are coming by boats and on foot as the access roads are all blocked by police. There is no bus service to this place. There is no sanitary complex and women bear the brunt of it. No public health official has ever come to help the people. “Some 15 of us have been on indefinite hunger strike and no medical doctor has ever come here to check our health. On March 21 my mother received a phone call from a lawyer called T. Udayakumar, who claimed he was calling from the DGP office in Chennai. He told her to ask me to leave the protest so that all the cases against me would be dropped and I would get whatever I ask for. My mother told him that I was not a man of that nature and ended the conversation. That evening the Superintendent of Police of Tirunelveli District called me on my mobile and asked me to surrender alone so that people would not be affected. I told him that I was all ready for that but the people here at Idinthakarai also wanted to get arrested along with me and they would not let me go alone. I proposed to the SP to send enough number of buses and two police officers so that there would not be any stampede or tussle and we all would board the buses peacefully and go wherever they wanted us to go. He would not accept that proposition and said in anger: “This is the last time I talk to you.” There ended our conversation. “That night the police officer who was on security duty at our SACCER Matriculation School outside Nagercoil town had received a phone call from the Kanyakumari District SP office to go away from the school. Then a group of vandals, obviously with the blessings of the police, entered the school and destroyed it very badly. The compound wall was completely demolished and the gate damaged. They ransacked the school bus after tearing down the car shed’s iron shutters. They entered the KG classrooms and destroyed all the small little chairs which my children were using to sit on. They broke all the tables and chairs and I do not understand why they punished my little children like this. The vandals entered our school library and destroyed all the 12 glass bookshelves and tables and threw away the books. My 250 children are all avid readers and have been using our library extensively. This reminds me of the burning of the Public Library at Jaffna a few years ago. “The governments and the police treat and speak of me as if I were Osama bin Laden and our people some mindless terrorists. We resent this inhuman and brutal treatment. Electricity, water, milk and other essentials have been cut for two days; people cannot go out of and come into Idinthakarai as there is brutal police control. We are surrounded by police and I truly feel like I am at Mullivaickal. We are a group of simple people who have been fighting nonviolently and democratically against an untested foreign reactor with all kinds of problems and hiccups. We have not done any harm to anybody or anybody’s property in our eight-month long struggle. The whole country is proud of our people. “The stalemate continues. There are protests happening all over the country and the state of Tamil Nadu. Whoever is farsighted enough to worry about the future of India’s “ordinary citizens,” our natural resources, the well-being of our progeny, the possibility of losing our freedom to the New Nuclear East India Companies and most importantly, the democratic fabric of our country support us. “Information from the Koodankulam Nuclear Power Plant nonviolent struggle is scarce as Tamil Nadu authorities imposed an efficient news blackout by blockading roads and accesses. A major reason for the strangulation of information is the authorities’ fear that the movement will spread to other areas in the country. “However, doctors were under order not to take the 15 hunger strikers to a hospital given the potential for violent backlashes if Kuma (Udayakumar) or others were removed from the scene. They earned a lot of respect and the staunch support of the population. “We are ready for talks. If we are considered people of this country and if our ahimsa protest is respected, government should talk to us. They should treat us like Indian people,” Mr. Udayakumar, on an indefinite fast since March 12 along with his supporters, told reporters in Idinthakarai near Tirunelveli, the epicentre of the stir against the project. He said it was regrettable that the government was suddenly “belittling” the protesters by accusing them of having links with Maoists and foreign countries. Thus the non – violent struggle of the people goes on in Koodankulam.One does not know when the authorities would crack down further and arrest the fasting grass roots activists. One hopes and demands that saner counsel will prevail and that those in power would respect the peaceful protestors and talk as Udayakumar wants. As for me I want to express my solidarity and support for SP Udayakumar and the people engaged in a peaceful protest against formidable foes for a worthwhile cause. Power to the People and may God save us all! God definitely will save us. How can Sri Lanka/ns support SP Udayakumar’s cause? Does SL not have a stake in this matter too? Do you know if this issue will be raised at the current Nuclear Security summit in South Korea attended by Obama and other world leaders? All persons who subscribe to the ideals of PMANE have a stake in this issue and can lend moral support to the cause of the people. Dinamalar has published series of articles and created an impression that Udayakumar is anti national. Dinamalar ascertained that the impending power crisis will be resolved if the plant is commisioned. A large section of the TN people subscribe to this. Yesterday, there was a news item in Dinamalar which states that Vaiko went to meet the protestors to revive his political career. The writer conveniently forgets, rather hides the fact that Vaiko opposed the proposal of building nuclear power plant at Koodankulam when it was tabled in the Parliament by Rajiv Gandhi. Since then, Vaiko has been protesting against nuclear power. The immoral media and corrupt news reporters have ruined many geniune struggles by the people. Koodankulam struggle is no exception. So, as usual, the next step of Indian Government is going to be “WAR ON TERROR”. This is a globalised world hence disaster in one country has serious repercussions in rest of the world. If you need to avoid man made disasters consume less. Nuclear energy production is a relatively low pollution process for the environment and hence good form of future energy source provided the design and construction of the plant strictly conforms to the applicable latest and highest standards including the location is very far away from any seismic zones. This location is sufficiently far away from seismic zones and invoking fear by comparing Japan that is in high seismic zone is very unfair and wrong. We can’t rely on fossil fuel energy source forever and got to transition into alternative cleaner and safer forms of energy sooner or later. The fair concern is that it is absolutely necessary to maintain corruption free process during design, construction, operation, maintenance and decommission. If there were any release of radiation due to malfunction or accident, not only south India but also northern Sri Lanka will face various levels of radiation consequences. It is strange that every(if not most) Nuclear power station should be in Thamil Nadu. Already there is one near Chennai. This is akin to SL government siting Coal Power Plants in Tamil speaking areas like Nuraicholai and now Sampoorstrangely with the assistance of Indian Government).Why not in U.P or M.P. in the north. Still Japanese people are suffering. The only way to cater to the energy needs of the future is “Go Nuclear”. The west doesnt like Asian and African countries developing this technology because they would like to dominate the industry and business in the future. It’s only a few handful of people demonstrating against this wisdom which is destined to take India to great heights to be self suffiecient in energy needs. Irrespective of its politico economic sensitivity, I think this campaign by Uthayakumar deserves the support of everyone. We have seen Bhopal,Chernobyl and lately Fukushima. This part of the world doesn’t have any strength to defend anything of that sort. Neither would it be able to recover from it if it happens. It will only be curtains for Sri Lanka and most of Tamil Nadu. Sri Lanka needs to oppose this Nuclear plant. If a natural disaster hits Koodankulam, radiation will definitely reach West coast of Sri Lanka. There is no clear boundaries or distance about the radiation effect. India may stop or oppose SL oil exploration plans in around Mannar indicating it would affect Koodankulam or they may even win the oil exploration agreement by pointing out about Koodankulam Nuclear plant instead of SL giving out licences to European or Chinese companies. Only time will answer these doubts. What is happening in Idinja karai and Koodan Kulam ( Unsuitable water pound) remind me of initial phases of political developments in Jaffna in the 1980’s, which culminated in May’2009, after a lot of tragedy. The tragedy of Jaffna and hence the North- East started with different targets, aims and objectives- all very laudable and high brow. This initial phase was infiltrated and subverted by ideologies with foolish objectives and dangerous designs. Manipulations which led to the hijacking of a laudable movement, using the gullibility and emotions of people, techniques of propaganda and persuasive violence as tools, has left us where we are now. Altruistic concerns about the good of humanity, compassion etc, are sweet, but based on wrong premises in this instance. This has opened the way for drum-beaters, mass media and politicians become involved and poison the entire movement. The values under laying a society are devalued and the benefits to the larger society are denied. Those in the initial movement are forced or enticed to become willing or silent partners with money, muscle and weapons. The seeds were future anarchy are thus laid. The big question is why not Idinjakarai and Koodang Kulam, when Kalpakkam, has been functioning safely for several decades. Tamil Nadu is not Japan. Tamil Nadu is not in a seismic zone. Tamil Nadu needs electricity, if it needs to progress. Further, the new plant at Koodang Kulam will be more modern and safer than the one at Kalpakkam. In 1990, in Chennai, person at the age of 50’s was telling a group persons that, “What happened in Jaffna (N&E) will come into Tamil Nadu in a matter of five years”. This prediction has come true, at Coimbatore, Sri Perumbuthur( Rajiv Gandhi’s murder) and now Idincha karai. The current episode in Koodang Kulam is between modernity vs. backwardness, problem solving vs. problem festering, development vs. stagnation, destruction vs. creativity, hidden agenda vs. openness and greater good, productivity vs. non-productivity, poverty vs. affluence and malnutrition /hunger vs. health. Compassion should be in action and not in words. Out dated philosophies and slogans deliver nothing. Irrelevant, out dated formulae, deliver nothing but disaster, misery destruction, blood, tears, hunger, emaciation and death. Jaffna (N & E) knows the value and need for energy, as we had starved of it for 30 years. In case, you don’t want the nuclear plant set it up at Kachchathivu, with the concurrence of the Sri Lankan government. Both Sri Lanka and Tamil Nadu can share the power generated. There are always possibilities for disaster for people, in whatever we do. Jaffna and Sri Lanka will definitely welcome such a gift from Uthayakumar and company. You are now experiencing initial symptoms of the pains to come. You will experience lots of such manifestation of negativity, as your rulers, platform heroes, power holders and power brokers are the generators of such manifestations. Jaffna ( N & E) had enough and more. Save yourselves, from your own enemies, within. This kudankulam nuclear project is a big one costing 3 billion USD,started by rajiv ghandhi with russia.Jaya and mamata bannerjee of bengal are having opposite views on nuclear plants.Bannerjee has banned them completely lock stock and barrel from bengal,while jeya has given the go ahead.This is one of the interesting facets of devolution of powers where we can see richness in diversity of views and debate them. Kundankulam plant has 2 reactors and will generate power of 1000mw each,so the plant will give 2000 mw of power.Naturally jaya wants electricity in a power hungry and fast developing tamilnadu and would be willing to take risks for it.2 more reactors also can go into the same site in the future,giving another 2000 mw,for a sum total of 4000 mw from this plant. I personally think that jaya jumped the gun when giving the green light for it to go ahead.There is a huge weakness in the way that the present nuclear regulatory system in in force in india.The regulator which is the Atomic Energy Regulatory Board is answerable to those whom it is supposed to be watching over.It is part of the Dept of Atomic Energy and reports to the Atomic Energy Commision,which in turn reports to the primeminister.So they are palying with themselves here a home and home match and the regulator answers to those it supposed to regulate,a ridiclous arrangement indeed,for such an important and dangerous situation.If a chernobyl like disaster takes place in tamilnadu,then jaya will be primarily responsible for it.That is the beauty of devolution,those who are closest to the people will be held responsible,and the people can’t blame the northern aryans for their predicament.Their own chief minister has told to go ahead,and now is undemocratically using stopping people from protesting. Jaya should have insisted on the Atomic Energy Regulatory Board to become a statutory body,and that it should conduct regular checks and give its findings openly and transparently,preferably on the web,unlike the present cloak and dagger stuff going on,with only the prime minister knowing the true situation of the plant.Otherwise she is going to hold the baby one day,not manmohan singh.We too in srilanka are going to be affected badly with deformed children for generations just like in chernobyl. I met a guy from tamilnadu yesterday who told me that only a quarter of the energy produced at this plant will be for tamilnadu.I can’t understand why tamilnadu is taking such a risk for just a quarter of the power.The correct thing would have been to negotiate for excess power to be channelled to other states.He also told me that mamata bannerjee asked for massive personal amounts of money when a nuclear plant was proposed for west bengal,and opposed it for that reason when payment was not made.I’m wondering from this whether influential people in tamilnadu were paid for this plant to go ahead.